The 944 Turbo cooling system operates bypassing the radiator until the coolant temperature reaches 83 °C when the thermostat opens. After the thermostat opens, coolant is circulated through the radiator and back to the suction of the water pump. Flow through the heater core is controlled by a vacuum operated diaphragm valve the fail open on loss of vacuum. Vacuum is supplied to the valve operator via a vacuum solenoid in the HVAC system. 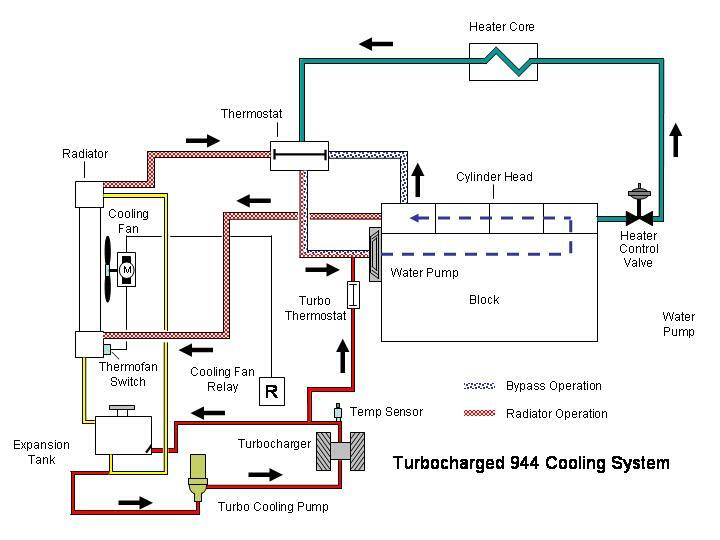 With the engine shutdown, if the temperature in the discharge cooling line from the turbocharger rises to 115 °C (as sensed by a temperature sensor), the electric turbocharger cooling pump comes on to circulate coolant from the expansion tank, through the turbocharger, and back to the expansion tank. The turbocharger cooling pump also comes on for 25 seconds any time the engine is shut off regardless of the temperature in the discharge line. When the engine is running, a turbo thermostat opens at 82 °C. The water pump then draws coolant from the expansion tank through the non-running turbo cooling pump and through the turbocharger bearing housing. A check valve in the expansion tank prevents coolant from being drawn from the turbocharger discharge line back to the expansion tank. Otherwise flow would bypass the turbocharger.